Each month, TorqueNews works with the members from the Camaros Unlimited Facebook group to select our Camaro of the Month. The process begins with the members of the Camaros Unlimited Facebook page – nearly 42,000 of them – nominating their favorite Chevrolet Camaro owned by a fellow member of the page. Once five owners have been nominated, the voting begins and when the balloting closes – we have our Camaro of the Month. For May 2018, our Camaro of the Month is the wicked 1969 SS pro street beast shown here, owned by Carm Spataro. We reached out to Carm for more information on his car and below, you will find all of the details on this badass ’69 Camaro. I’ve had the car from the day I turned 19 in 1980. It’s been through a couple of make overs, but has looked this way since 1993. I had a little fire mishap with car in 1991 that’s when I decided to cut her up and go the prostreet platform. For the purist and faint of heart, this car is not an original big block car. It’s a tribute. I would’ve never cut up [an original big block] car. That being said it’s an original GM steel car. Stock front suspension tied to all tube chassis coil over 4 link rear suspension. Engine is just a baby big block nowadays - 475 cubic inch, aluminum heads, solid roller camshaft, 1050 dominator carb with multi stage NOS nitrous system. Transmission is a turbo 400 with a 5500 converter and trans brake. Rear end is 12 bolt with strange axles, a spool and 4.88 gears. I wanted a resto prostreet that doesn’t scream look at I’m tubbed I think I achieved that. 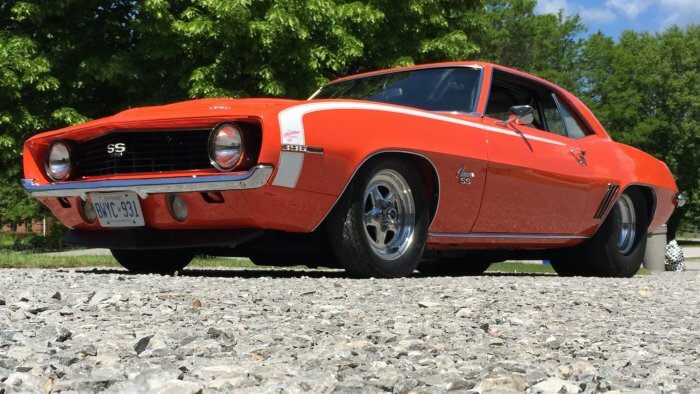 Congratulations to Carm Spataro and his 1969 Camaro SS pro street machine for winning the TorqueNews/Camaros Unlimited Camaro of the Month for May 2018. If you would like to participate in the Camaro of the Month program with your Chevy muscle car, click here to join Camaros Unlimited!